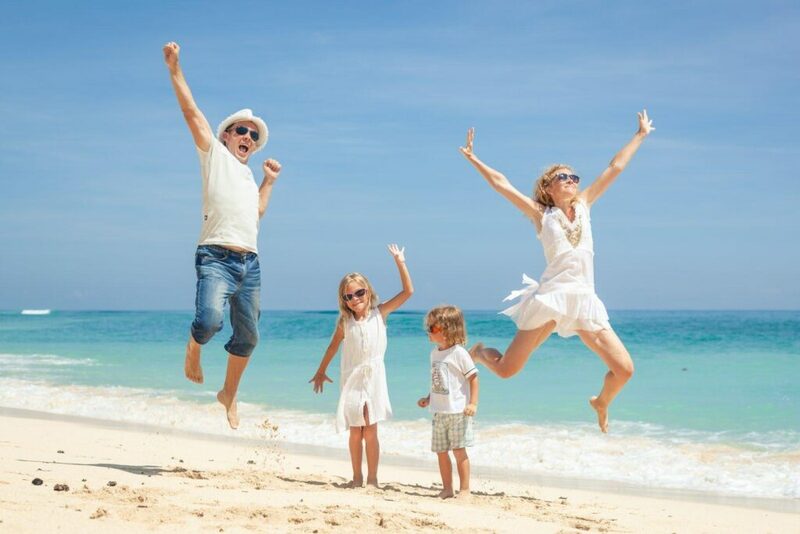 Family vacation is a time for making lifelong memories for everyone, to step away from the daily grind and all of the stress and have new experiences. However, figuring out how to relax on vacation with family is not always the easiest thing. 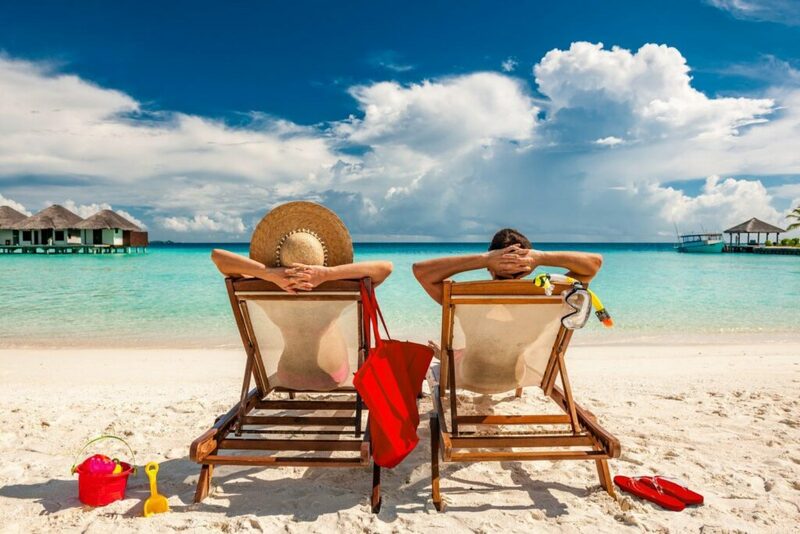 Vacation means the disruption of routines, new experiences that are fun but sometimes also stressful, and enjoying a family vacation sometimes requires a reset in expectations and habits. 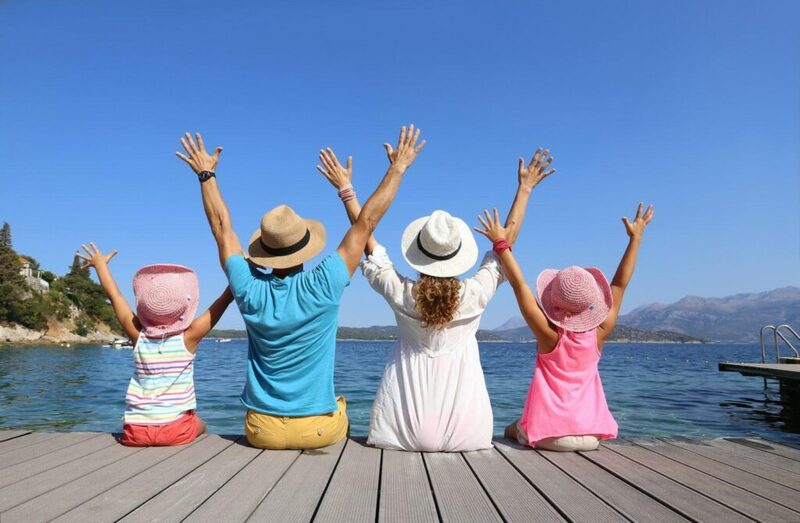 Whether traveling with just your kids or extended family, there are usually bound to be some moments of frustration on vacation but learning how to relax on vacation with family is possible. We’ve been traveling as a family since my first son was born. Now, we travel frequently with two toddlers and I like to think we’ve finally figured out not only how to relax on vacation with family but how to enjoy a vacation with a toddler, which can be even more difficult. 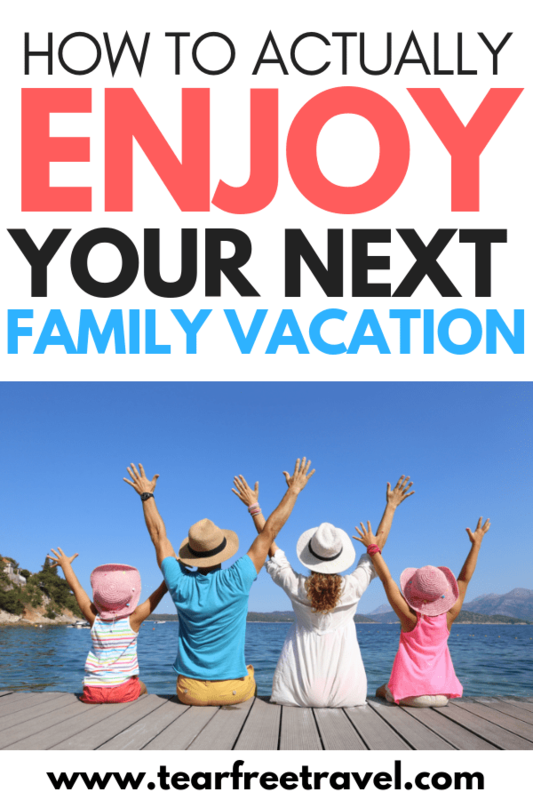 Here are 5 family travel tips for relaxing on vacation! Slow your morning routine – don’t rush around and stress. Mornings can be stressful – there’s no doubt about it. In our house, mornings are a bit crazy, trying to get ready for work, get the kids up, cook breakfast, etc. I think we all wake up a little earlier than we’d prefer. Vacation shouldn’t be like that. If your kids are older, vacation is a great time to let everyone just wake up naturally without an alarm and you can even tell the older kids that before a certain time, they should expect to just hang out quietly in their rooms, allowing parents to sleep in. With toddlers, it’s a bit different as they don’t typically like to sleep in! I also find it’s best to keep them as close to their regular sleep schedule as possible. That doesn’t mean the mornings have to be chaotic, though. Use family vacation as a great excuse to laze around in the mornings. Order room service instead of cooking and don’t worry about rushing out the door so early everyone needs to be right on schedule. The beach will still be there in an hour. Another way to take advantage of lazy mornings, and one of my best tips for enjoying a vacation with a toddler, is to alternate morning responsibilities. One morning mom gets up early with the kids while dad sleeps til 9 am and the next morning, mom gets to sleep in. Plan some time apart – recharge your batteries. Yes, the point of family vacation is to spend time together as a family. However, one way to relax and keep your sanity on a trip is to plan some time apart. This can mean that mom or dad take turns getting some quiet time or, depending on where you travel, it can mean hiring a sitter for the night so that the parents can enjoy a nice evening out or a walk along the beach. Most resorts and all-inclusives have a kids club full of games and activities where parents can drop their kids off for a while, knowing they’ll be under safe supervision. On our recent trip to the Grand Palladium White Sands, we left our kids in their kid club on two separate occasions, to enjoy some adult time. While it can feel selfish to leave your kids while you’re on vacation, it’s truly not. Not only will you be recharged after their visit, but your kids will also most likely have a blast! On our Disney Cruise, my kids didn’t want to LEAVE the kids club. Make a point of incorporating some downtime into the day. 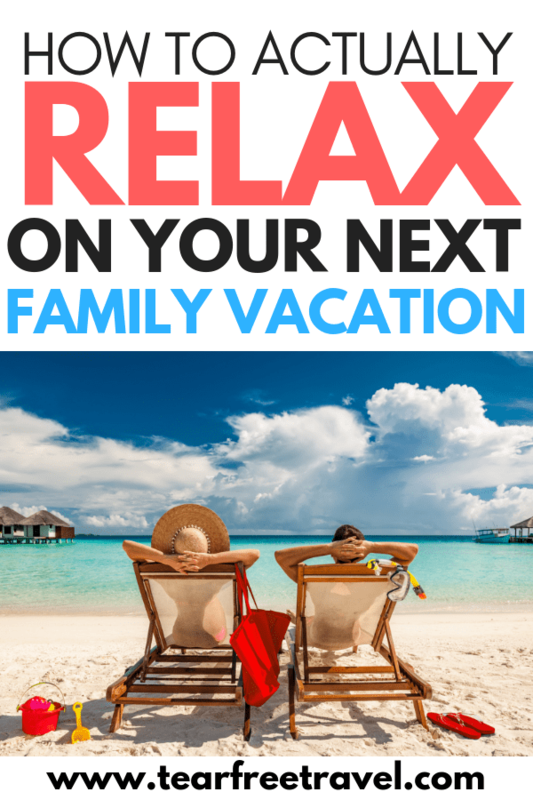 The easiest way to relax on family vacation? Plan some specific time to relax. It can be tempting to try to pack as much into a vacation as possible but, especially traveling with small children, this can be a big mistake. Instead of trying to do as many activities as possible, pick a select few that are the best fit for your family and then plan some time to spend relaxing by the pool or on the beach as well. And remember – everything takes longer with a toddler. Everything. Before kids, you may have planned to visit three cities in one-week long trip. With kids, 1 or 2 cities is probably a better bet. Packing in too much is tempting, but you will undoubtedly come back from vacation needing another vacation! My friend Emily has great tips for keeping expectations in check in her post ‘Why we take our kids to Europe.‘ She has relaxed travel down to an art! Rent a vacation home instead of trying to stay in one hotel room. This is actually one of the biggest pieces of advice I can give to someone on how to enjoy a vacation with a toddler. Rent a vacation home. While it may seem tempting budget-wise to cram everyone into a single hotel room, I highly recommend against it. Having a separate sleeping area allows for a small amount of privacy and can also be helpful in keeping a consistent sleep schedule (see next tip). Even if there’s only one bedroom, small kids can sleep on the couch or pack and play while adults sleep in the bedroom and the bedroom can also be a good place for kids to nap. When traveling with kids who nap, you’ll likely be spending more time in your accommodation than you might on any other vacation. By having more than just a small hotel room, you’ll have more space to relax and enjoy yourself while the kids sleep. Our favorite places to rent with kids are Airbnb and HomeAway. Plan the day around their usual sleep schedule. While one of the greatest gifts of travel is spontaneity, and I do encourage incorporating flexibility in your travel schedule, the best way to avoid cranky kids on vacation is to keep a regular sleep schedule. While there may be some variations in the times due to time differences and the excitement of travel the first few days, try to stay consistent with the same nap times as at home. This includes going to bed at approximately the same time and keeping up with a similar bedtime routine when possible. I found out the hard way how important a consistent sleep schedule is in how to enjoy a vacation with a toddler – let’s just say the first few trips were a real learning process – and we now plan our days after the nap schedules of our kids. It means fewer activities but makes the entire trip much more relaxing and enjoyable. Whether it’s your first trip or your tenth, these simple family travel tips can help you enjoy a family vacation, wherever you decide to go.